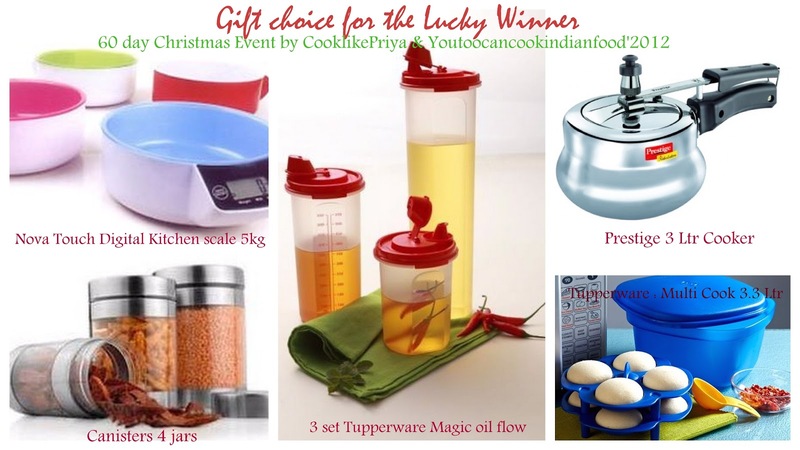 "60 Days To Christmas Event"
We are so very sorry for the delay, but am sure you would have understood our plight we had 694 recipes [323 + 2 from readers recipes, from my space and 369 from Priya's space] to analyse and we wanted the results to be genuine. The winner selection was the most easiest part as we had used random number generator. We are so happy to that we got good responses and we feel delighted to announce the winner of this successful event on this special day. I really thank Priya for being a good support and a very good event partner, we enjoyed working together, discussing things and sorting out everything together. Throughout the event felt that doing things together did help us know new things, do work more perfectly. I really wanted to give an award to all who sent the recipes but its not possible as we all know. But we have tried our maximum to award the best recipes. Me and Priya had taken so much time to go through each and every recipe as we did not want anyone's effort to be underestimated. I know by now you would have scrolled down to view the winner. There is only 1 winner for this event and we have kept in mind all rules stated in our announcement page. Click HERE to check them. Totally 122 bloggers had participated and 2 of my readers Shafeeka and Meena had sent their recipes too. Every recipe deserves a win, because we know how much effort and work a recipe needs and so every participant is a winner in her own way, but still a competition is a competition, hope you agree and so we have tried to do justice to all the recipes and have selected few awards here to motivate the participants. Those who haven't won an award doesn't mean that your recipes were not eligible nor were inferior to other recipes, its just an event and hope you take things positively. Now its time to shower awards!! Our thanks and warm wishes to all who participated in our event and made it successful!! Please do accept this award as a token of our appreciation for you!! Thanks again!! Goes to Jillu Anand for sending 38 entries to the event!! Since the event ran in two separate pages we consolidated all the recipes in an order. The order resembles that of a menu, first comes the appetizer, soups, rice and curry recipes, then comes the dessert, sweets, cakes and drinks. So the recipes linked to my space comes first then comes links from Priya's space. Am so happy for ya!! Wow, that is one Event!!! Great people, Congrats to all the participants and winners!!! Kudos to both of you (Divya and Priya) for conducting such an awesome Event!!! Kudos to Priya and Divya for conducting the event.Congrats to all award winners and Sanoli. Nice Work Divya! Congrats Sanoli! Lovely round up Divya !!! Congrats to the winners, fabulous team work and hats off to both of you..Well done Divya and Priya. Congratulation Sanoli... :) And Congrats to All winners too. A Lovely round up Divya. Congrats Sanoli, you guys did lot of homework. Very nice round up Divya. Appreciating the dedication and efforts in making it a success. Congrats to Priya and Sanoli. Wow that's a pleasant surprise to see my whole chicken fry recipe in the list. Thanks for the award....I am much thrilled and excited dear:) Do more events da. Congrats n best wishes! Nice Round up and thanks for choosing my dish. Nice event. Congrats Divya. You both have done good job. Congrats Sanoli. Wow! Congrats Sanoli & all best selected recipe award winners. Great work.Like to try out all the selected recipes. Congrats winners. Great Work by you both. 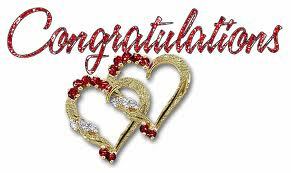 My hearty congratulations to all winner friends....Will mail you soon Divya. Great work Divya & Priya !! And congrats to all the winners..
Nice roundup and such a hard work !! Thank you for the lovely Award. You guys rock. Loved participating and would like to personally thank you both for hosting such a wonderful event. Thank you dear...Congrats sanoli !! wow...Fabulous Round Up!! I know h much effort n time u both put for this event, kudos to Priya & U, very good team work! !...Congrats to all the Winners n special Wishes to Sanoli! 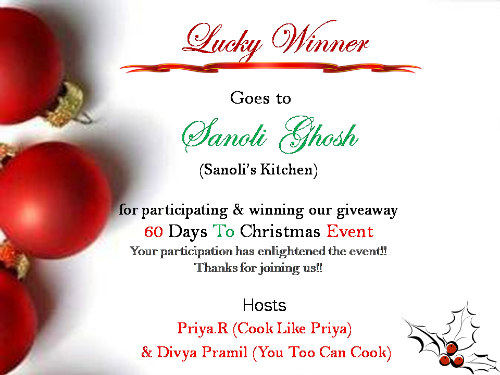 Congrats both of you(Divya & priya)..Thanx for the award too dearies,Fabulous round up!! Great job Divz & Priya..Happy participating in the event here. Thanks for the lovely award..Congrats to all the winners and Sonali..
very good event and congrats for all d winners..